Our beloved Berlin is boiling with temperatures reaching record highs this summer! Most likely, you don’t have time to flee the city for a dip in a cooling lake each day. Worry not, we got the solution for joy and refreshment in this heated situation: Delicious vegan ice cream! With the sun shining and everyone outside and in a good mood, we love everything about this long ice cream season. For you we got into the queues of Berlin’s inventive ice cream parlours to try and test especially their plant based varieties - quite a challenge considering all the new openings this season 🙂 Our food enthusiast Miri went out to taste her way through the vast choice, from fruity sorbets to creamy nut-based scoops. To make your decision easier, she wrote up this tempting top 5 guide. We’re super excited to be collaborating with the fabulous Berta Berlin for a map including our favourite vegan hot spots in Berlin. You can already preorder the map here to receive it in autumn. While we’re busy finishing it for you we won’t deprive you of five cool spots from the map to sweeten your hot summer days in Berlin - after work, on weekends or for taking a break from sightseeing on your travels: Ice cream shops are the perfect place to meet and hang out. Enjoy ice “green”, help save the world! 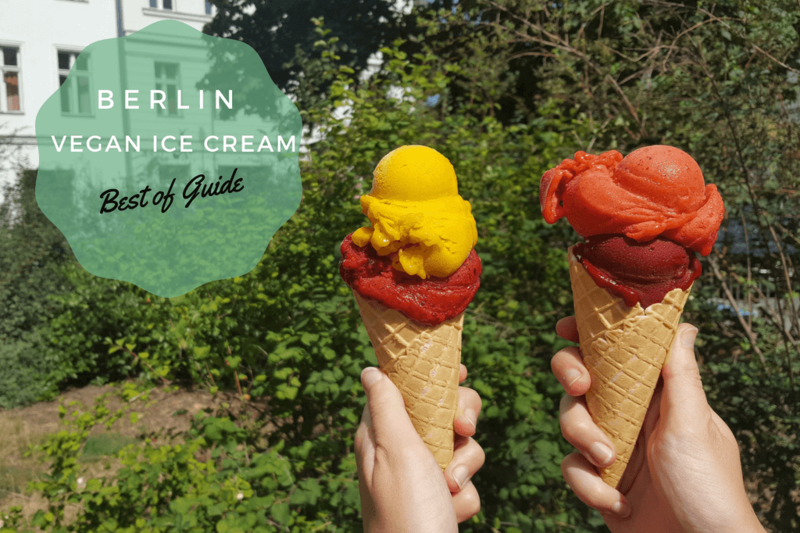 WHO'S MAKING THE BEST VEGAN ICE CREAM IN BERLIN? Check out the first ALL vegan ice cream shop of Berlin in the heart of Friedrichshain, right at the lively Boxhagener Platz - yes, even the waffles, toppings and whipped cream are vegan at Balaram! Since 2016, Ferdinand and his friendly team offer specialities of the local vegan ice producer Eiskontor Berlin. With 18 regularly changing creative flavours like New York Cheesecake or Peanut Butter, the only downside here is that you have to make a choice: We recommend to try out a larger variety of flavours by opting for kid’s scoops and definitely pimp your choice in the „free-topping-area“ with sauces and crumbles. Beautiful colourful, creamy, delicious! Tip: The same team also runs the amazing Goura Pakora - an all-vegan South Indian restaurant just around the corner. Swing by and taste some of the best Masala dosas and vegan mango lassis in town. Nestled in the picturesque Kollwitzkiez, not far from the famous Mauerpark in Prenzlauer Berg, there is another ALL vegan ice cream shop in Rykestraße that we absolutely love! Here, everything is made right in house. Inspired and back from New York, Frank and Klaus of Tribeca Ice Cream created a concept and a product that is good for your health and the planet: Only organic products are used, their entire range of ice cream is based on rice milk and coconut oil and all their homemade creations are without refined sugar and and free of soy or gluten! The (n)ice guys proof that plant-based ice is so much more than fruit sorbet and offer some seriously innovative fillings for your Tribeca cones, bowls and sandwiches. You might want to stop here multiple times this summer to sample all their exciting and interesting flavours from raw-chocolate and maca-salty-caramel to banana-walnut ice cream! Our secret favorite is pistaccio-luccuma. This place is a gem and we’re very curious about their plans for the future. The creamy tribeca vegan ice cream is also available in delicatessen shops or at various festivals, from their mobile ice cream counter. The only thing making the beautiful sun set over Tempelhofer Feld in Neukölln even better is enjoying it with our favourite homemade ice cream from Mos Eisley in your hands. The small ice cream shop of Daniela Teuber, who learned her skills from the best at a Gelato University in Italy, is another destination where vegan ice cream dreams come true. Though not all vegan, you’ll always find a great variety of sorbets and weekly changing soy-based choices in their gelato cabinet at Herrfurthplatz! Alongside the Italian classics and spins they serve up exceptional flavours you find nowhere else like Hazelnut-Soy, Apricot-Thyme or Cucumber-Tonic. Every day all their ice cream is made freshly for you with natural ingredients and lots of love: outstandingly delicious. Note: Keep an eye out for Zwei Dicke Bären ice cream sandwiches: A combination of homemade cookies and ice cream made by Mos Eisley on offer at foodie events around Berlin like Street Food Thursday or Bite Cub! Paletas is a real diamond amongst the local ice makers. These Berlin manufacturers specializing in ice popsicles make their yummy paletas from whole fruits and fresh ingredients since summer 2012. Enjoy the paletas ice lolly happiness in many cafés throughout Berlin or in their own shop in Friedrichshain. With lots of vegan varieties (fruit sorbets as well as flavors based on coconut) we promise you taste explosions of blueberry cheesecake, strawberry-lime, buttermilk-lemon, mango coconut, raspberry-vanilla. Topped with toppings! Look out for their popsicles at all types of events, markets or concerts - such as the legendary Green Market Berlin - or invite them to cater your own summer party. Anywhere and anytime - Paletas is an “I scream, ice cream” experience! Perfect to spend a sunny afternoon with ice cream and a really good Italian coffee in the middle of Berlin: the colorful Duo Sicilian Ice Cream parlour. Get excited about original Sicilian family ice recipes and coop sizes that don’t leave any wishes unfilled. This is ice cream exactly how it should taste. Thanks to the true talent and expertise of the owners you receive highest quality, amazing creamy consistency and no refined sugar or artificial flavor. If you’re someone who has a hard time to decide, then this is your place, as duo recommends you which two flavors go with each other best. Heaven! Vegan (and non-vegan) hearts will be in love with the plant-based highlights on the menu (which makes up around 50% of all flavors) - which you can also turn into a divine milkshake: hazelnut, coconut, coffee, dark chocolate, nougat, pistachio, pineapple, raspberry, strawberry, and only here: avocado. They even got a sugar-free option! Big tasty plus: all the waffles are handmade and vegan. P.S. Coconut was to die for - you could taste its pure, natural ingredients like crunchy coconut chunks. The location of Duo in the vibrant Kreuzberg area couldn’t be better. While there’s some serious ice cream making going on in the backroom, you can sit down and chill in their outdoor seating area, watch the iconic yellow Berlin metro ride by, or take your ice for a stroll around to the river Spree. We highly recommend you to visit this friendly family ice cream business and figure out your personal vegan ice-cream duo! Buy it for home: Most supermarkets have a range of vegan ice creams, especially Denn’s, Veganz or Bio Company > we highly recommend lupine ice cream by Made with LUVE . It’s healthy, sustainable and locally produced! WHAT'S YOUR FAVORITE PLACE FOR VEGAN ICE CREAM IN BERLIN? Is there any place we should definitely try? We're burning to find out! Share your thoughts with us in the comments (right at the bottom of this page).